In this context, social cohesion is understood as the quality of social cooperation and togetherness in a territorially delimited community. More specifically, a highly cohesive society is characterized by three elements: Resilient social relationships, a positive emotional connectedness between its members and the community as well as a pronounced focus on the common good. The economic and political rise of Asia is undeniable. It extends well beyond the resurgence of China. At the same time, societal challenges are also increasing in the region. Almost all Asian societies find themselves in a state of upheaval, as they are undergoing profound transformation processes. Urbanization is advancing almost everywhere. A new middle class is emerging, as traditions and values are changing due to increasing mobility, education and prosperity. In many places, socio-economic inequality has become more prevalent. Because of these developments, there are tensions and conflicts in numerous Asian countries that threaten social cohesion and political stability. 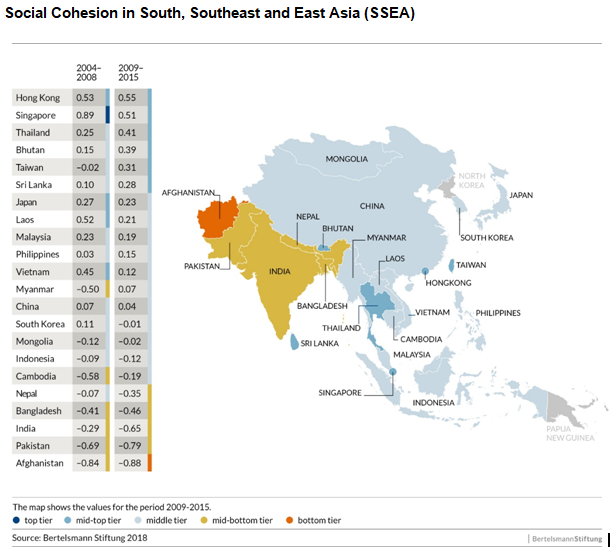 The question of how the cohesion of societies can be advanced is therefore becoming increasingly important in Asia. 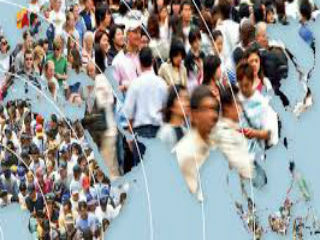 Against this backdrop, a new study, commissioned by the Bertelsmann Stiftung, presents for the first time comparative empirical data on social cohesion in 22 societies in South, Southeast and East Asia (SSEA). To measure social cohesion in these countries, the study employed the “Social Cohesion Radar” (SCR), a multidimensional measuring instrument that integrates different facets of cohesion. Overall, the findings show that that social cohesion is strongest in the economically most advanced societies. However, there are also less developed countries with a high level of social cohesion. Hong Kong and Singapore are in the lead, followed by Thailand and Bhutan. In the overall index of all societies surveyed over the entire period under study (see Figure), a moderate level of cohesion was found in Japan, South Korea, China and most of the ASEAN countries, while the South Asian countries register the lowest levels. Economic development, prosperity, human development (especially education and life expectancy) and gender equality are key factors fostering social cohesion in the region. Conversely, extreme poverty has the strongest negative impact, followed by discrimination against women. Social cohesion itself affects a number of important developments. It promotes economic productivity, reduces unemployment and provides prospects for a better life in the future. Moreover, cohesive societies are more effective in allocating resources to promote public goods. For the Asian societies investigated, it is thus true that economic and social modernization and social cohesion are not mutually exclusive. On the contrary, successful modernization strengthens social cohesion. But there are exceptions to this rule: There are also less developed, relatively isolated countries like Bhutan that have a high degree of social cohesion. Another intriguing finding is that a lower level of political freedom often correlates with a higher level of social cohesion. Conversely, social cohesion promotes the restriction of civil liberties and can strengthen the stability of authoritarian regimes. Accordingly, civil liberties and opportunities for participation are not necessarily prerequisites for high social cohesion, as the examples of Hong Kong and Singapore show. Rather, what matters is whether people regard the respective political regime as legitimate and effective. This is no surprise. After all, democracy promotes the articulation of specific and sometimes highly antagonistic interests and opinions. In some circumstances, this can lead to societal polarizations that are detrimental to social cohesion. This is especially true when there are no intermediary institutions that can successfully mediate these conflicts. This is what is happening in many of Asia’s young and still unstable democracies. They are struggling with political and social instability, widespread corruption and the failure of state institutions. At the same time, many citizens in the established democracies of Japan, South Korea and Taiwan appear to be more critical of their governments than people living in authoritarian regimes. They have higher expectations of their governments and are therefore more likely to be disappointed, even though their governments tend to perform better than those of non-democratic countries in terms of economic development and social justice. In conclusion, there is no silver bullet that leads to consistently strong social cohesion in this region. Rather, different constellations and factors contribute to a more or less cohesive society. In principle, however, policy approaches promoting inclusive economic development, poverty alleviation and gender equality offer the greatest prospects of success. Ultimately, this points to the Janus-faced nature of social cohesion in the South, Southeast and East Asia region: On the one hand, it can function as the glue that holds a society together, allowing for economic progress and an inclusive development policy. On the other hand, social cohesion can serve as a foundation for authoritarian political systems. This finding, ambivalent as it is, can help us better understand social cohesion in Asia and non-Western societies.